There are many things to consider when moving from paid employment to a lean startup. These can also give us reasons to stay in the desk job as the task of moving simply seems too overwhelming. The importance of networking, networking, networking! The importance of thinking it through and making a robust business plan. What is your business called and what industry is it in? We are presently establishing an Internet-based business covering several outdoor interests we’re passionate about. Our brand name came about in an unconventional way. We planned to research outdoor market segments to understand the state of the market and find gaps that offered business opportunities. Establishing a brand right from the start proved to be a smart decision. Using our brand as we researched and connected with people online exposed the brand to thousands of social media users. Three years ago we established the brand name EQUIPnTRIP and the tag line “sharing outdoors knowledge”. The branding is descriptive enough to allow viewers to understand that it has something to do with the outdoors. Yet, it is broad enough to allow us to choose from a wide range of topics. We engaged a graphic designer to design our logo that we modified to also use as an avatar. We use the branding wherever we have a social media presence on the Internet. Whilst conducting research we identified gaps in the outdoors market that mirror our passion for the outdoors. Later this year we’ll launch the EQUIPnTRIP online community for outdoors enthusiasts. What motivated you to start your freelance business? Several considerations drive our motivation. After 40 years in the workforce we have a growing desire to shape our own destiny by running our own business. Our children are now adults and we have financial capacity to transition from full-time to part-time employment that will allow us time to commit to building the online community until it becomes financially viable. We wish to remain active and don’t want to stop working for several years. We enjoy independent travel and wish to share our experience and skills with others. We enjoy meeting people whilst we travel and on the Internet. Tell us more about your business, what it is you do, and (if it isn’t totally clear for readers) how you earn your income. Our business is in the development stage and is yet to generate revenue. The primary focus of our business is building an online community for outdoor enthusiasts to connect and share their knowledge and experience with other community members. A secondary focus of the business is to offer consulting services, as freelancers, to businesses that sell outdoors related products and services and wish to enhance their online social media presence. In time we intend increasing our own independent travel that will provide useful content to the online community. As an Internet-based business we will be able to manage the online community from anywhere we have an Internet connection. Likewise, we will be able to provide freelance consulting services whilst we are travelling. We are clear about the need for our business to generate revenue but it’s not our main consideration for the first year. Initially we will concentrate on building the community. From year two our business plan sees revenue being earned from a range of sources including advertising, sponsorships or ambassadorships and product sales. In year three we will also start offering our skills as freelance consultants. What is a typical day in your work life like? My wife and I have backgrounds in face-to-face sales, business development, marketing and account management. We are both presently employed full time in sales and business development roles. 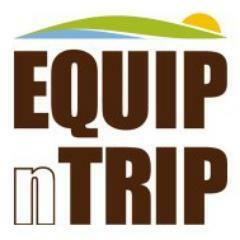 I presently spend one to two hours per day undertaking activities associated with EQUIPnTRIP. With a passion for the outdoors I’ve found research and making social media connections fun and relaxing. As EQUIPnTRIP comes online, our emphasis will change as we commit more time to building the online community. In time, we’ll commence transitioning from full-time to part-time employment to allow us to commit more time to EQUIPnTRIP. What have been your biggest successes so far and what was the main catalyst for achieving them? Our biggest success is yet to come but we have had some successes to date. Several online sources recommend blogs address a narrow topic. This was in contrast to our own interests in the outdoors that are broad and cover a range of associated topics. We believed that there must be others who also have similar broad interests in outdoor topics. We could have conducted passive research on the Internet and probably never verified that others also have broad interests in the outdoors. Our first success was realising that people who engage on social media generally have interests in a range of associated topics. The catalyst was our decision to “actively” research by connecting with others using social media tools. Whilst undertaking research we find interesting posts on blogs and websites about several topics of interest. We bookmark and tag those posts using Diigo, an online bookmarking service. We then promote the posts to several social media platforms and in return we receive direct comments from our connections and from metrics of the numbers of people who click through to the posts. This provides us valuable feedback about what posts are of interest to people and proved that readers generally have wide interests in the outdoors that go beyond the narrow topics recommended for blogs. Verifying that many people have broad interests changed our approach from a blog with a narrow topic to deciding to build an online community that will cover several topics of associated interest for community members. The second success was reaching 10,000 social media connections. This was achieved without a blog or website and having never published any of our own content. Early in our research we decided that if we reached 10,000 social media connections then we should start our online business. We recently reached our goal. If just one percent of our 10,000 connections join the EQUIPnTRIP online community then we’ll start the community with one hundred members; a fantastic way to kick start an online community. What have been your biggest challenges and what have you done to overcome them? We had two main challenges. The first challenge was moving from active research to implementing the online community. We were in our comfort zone conducting research and making connections where there is no commitment to anyone. It’s also easy to fall into the trap of analysis paralysis where you endlessly analyse your metrics without committing to the next step. Setting a goal to take action when we reached 10,000 social media connections was an important target for us. We were receiving about 100 new connections per week so it was easy to calculate when we would reach 10,000. As we neared 10,000 we started preparing an implementation plan that we are now executing. The second challenge was finding the gaps in the market that offered a business opportunity and deciding which gaps to act on. No-one wants to start a business and fail. We wanted to ensure that we started our business with the right focus. This proved to be a roadblock to us because we couldn’t decide which gap in the market was the “right one that guaranteed success. We also knew that an online business gave us the flexibility to fine tune or change direction at minimal cost and effort. Eventually we flipped out thinking and decided to approach the EQUIPnTRIP online community as an evolving experiment. Having this mind set will allow us to actively listen and encourage community members to contribute ideas about direction, focus and development of the online community. Importantly, the platform we will have the flexibility to support this approach. Adopting an evolutionary and consultative approach to working with our community has freed us from much of the concern we had about trying to ensure we had the right focus from the start. What have you discovered are the best ways of attracting new clients? Regularly posted quality content At this stage our clients are the people we have established social media connections with and others who follow EQUIPnTRIP but have not connected. We’ve found that people like regular, quality information on the subject/s they’re interested in. We put in place a workflow that takes the best posts we find and promotes them on various social media platforms. We publish links to these quality posts four times a day. Research on Twitter use advises that publishing at around 4.15 pm increases the number of people reached. Therefore, we publish at 4.15pm for the UK, US west coast, US east coast and Australian east coast. In three years we have promoted over 4,000 posts on social media platforms. Over this time we believe that we have built a reputation and credibility in the eyes of many of people we are connected with. They can rely on our posts being regular, offer quality information and are interesting. The 10,000 connections we have established comprise outdoors enthusiasts, bloggers and outdoors businesses with an online presence. How do you manage to stay an inspired freelancer and keep motivated? Having an interest in the field and an open mind to learning new things helps to maintain motivation. I’ve never considered it a chore spending time finding useful outdoors information and sharing it with like-minded people. As we find information we’re also learning more about the outdoors. Obtaining comments, feedback and thanks also helps to stay motivated. We regularly receive all three from those we are connected with. Finally, we are motivated to shape our own destiny by eventually leaving our current paid employment to become self-employed running the online community and offering consulting services as freelancers. What, in your opinion, is the main benefit of being freelance? Freelance work offers variety. Businesses operate in different ways and engage freelancers for a variety of assignments. The variety offers the freelancer the opportunity to not only apply their skills in slightly different ways to meet the needs of each assignment but also allows the freelancer to learn and broaden their skills. If you were to do it all again what would you do differently? Within 12 months of starting our research for EQUIPnTRIP we had a reasonable idea for our focus although we hadn’t identified the gaps in the market at that stage. We would have achieved greater brand exposure by starting a blog as a “home base” and fine tuning its focus as we progressed our research. A home base on the Internet is a website or blog where your brand, products and services are displayed. Social media tools such as Twitter, Google+, Pinterest, YouTube and Facebook are “outposts” that should connect to your home base. Chris Brogan coined the term “home base” and Darren Rowse at ProBlogger describes a home base and outposts in this post. What are your top 3 tips for others wanting to follow a similar freelance path to yourself? Tip One: Conduct research Research is essential to gain an understanding about your target market and to discover where the market opportunities exist. From your research you want to find at least one gap in the market that you can fill. Your research should also reveal that you should develop your backstory to describe how you arrived in your current position or how it lead to your product/s being developed. Your backstory should be authentic and resonate with your readers. It may also connect to how you can solve the problem of your customer or improve their business. Even a rudimentary plan is better than no plan. When you start your research you don’t need a business plan but your research should aim to answer questions that allow you to complete a business plan. Goals should act as triggers to prompt you to move to the next stage. Set goals that are realistic and help to maintain forward momentum. When you reach a goal you should be confident to act and move on to the next planned stage. Freelancers often work in fields that are specialised and continuously evolving. Businesses typically employ core skills to operate their business. They hire freelancers for their specialised skills that are outside of their core business skills and are used to meet a specific short term need. To remain competitive a freelancer must continue to learn and keep abreast of the evolving developments in their field of expertise. What are the top 3 tools you use that help you achieve what you do? RSS reader – until recently we used Google Reader but from mid 2013 it will be decommissioned by Google. We’re now trialling Feedly and gReader to see which of these RSS readers will best meet our needs. Diigo – an online bookmarking service to catalogue, tag and publish via RSS feed all the great content we find. Hootsuite – for managing social media connections and publishing to Twitter, Google+, Tumblr and other social platforms. What do you think is the next big thing in your industry? The way businesses engage with each other and the way information is consumed will both continue to evolve and are important to our online business interest. Most businesses don’t have the wherewithal to establish a viable online presence that attracts an audience, subscribers or membership. Blogs, forums, websites and online communities build audiences, subscribers or membership that are attractive marketing channels to businesses that wish to sell their products and services. New business models will emerge that support partnerships and collaboration between businesses that wish to gain access to consumers, and online businesses that have those consumers in the form of audiences, subscribers and members. People will continue to seek out quality online information on topics of interest to them. They will also continue to use the Internet to connect with friends, peers and others who have similar interests. Their buying decisions will be influenced by what their connections buy and recommend. Online communities provide an environment where people can consume quality information, make connections and research buying decisions and recommendations of their connections. 2015 – transition to full time work on the EQUIPnTRIP online community and offering freelance consulting services. Huge thanks goes to Allan McDonald for a fantastic and informative interview, and Brent McDonald for the brilliant photograph of Allan. Next story Digital Nomad: Is It Really Possible To Have Location Independence?